Rascal Flatts is moving ahead with a new album despite the dissolution of its record label last week. The trio said during rehearsals for the Academy of Country Music Awards, presented Sunday, they were surprised by Disney's move to close Nashville, Tenn.-based Lyric Street Records - the only label they've known. But a single is still due in June and an album will be out in September. "It will be out on somewhere," singer Gary LeVox said. "We're still moving full steam ahead and we're just pumped about the new stuff that we're cutting. It's just a sad deal. That was our family for 12 years. It just kind of blindsided us. It was just kind of out of the blue. It's still a little shocking." The Walt Disney Co. kept a few employees to help Rascal Flatts with the untitled album of all new material, and the group will remain under the company's umbrella, though Disney has not made any public announcements about a new home. Twenty to 25 Lyric Street employees have or eventually will lose their jobs. Some of the label's acts were dropped as well. "We've still got the same radio promo team in place and they're still working our singles, so you know it's just business as usual for us," bassist Jay DeMarcus said. "Unfortunately there's just not as many people around as there used to be." 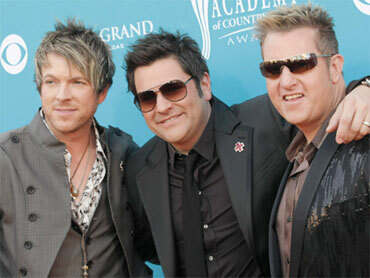 Rascal Flatts is one of country music's top acts, selling more than 20 million albums over the last decade. The group just wrapped up a tour and will start another on June 25 in Raleigh, N.C. The tour will feature 26 shows, with stops including Hartford, Conn.; Columbus, Ohio; Washington; and Syracuse, N.Y. It will end in Boston on Sept. 19. The band took a different approach with the new album. Because of a long and dreary winter, they fled Tennessee and recorded tracks in Santa Barbara, Calif., for the first time. They're finishing the overdubbing in Nashville, but can hear a difference in their sound due to the trip out West. "It relaxed us, you know what I mean," guitarist Joe Don Rooney said. "We didn't have the hustle and bustle of going back home from the studio and being in Nashville in the crazy traffic. We were pretty close to the studio in Santa Barbara and we got to spend 14 to 16 hours a day in the studio. By the time we got home we were tired enough just to sleep at the place we rented. We got a lot of work done that way. It was a really cool experience." Added DeMarcus: "I think that's what made it so refreshing, is that for one intense period of time we got to concentrate on the music we were making. That kind of intense focus shows in those tracks that were recorded out there."